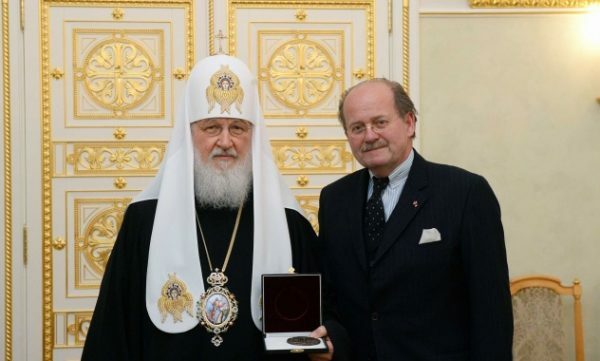 On 9 April 2018, after the Divine Liturgy at the Cathedral of the Holy Dormition in the Moscow Kremlin, His Holiness Patriarch Kirill of Moscow and All Russia met with Prof. Wolfgang Johannes Bandion, chair of the Austrian Association of Mauthausen Survivors (Mauthausen Committee, Austria). Taking part in the meeting held in the Patriarchal chambers of the Palace of Facets, were also Mr. Stefan Weidinger, Minister Plenipotentiary at the Austrian Embassy in Moscow; Mr. Alexey Konopatchenkov, member of the International Mauthausen Committee, chair of the Russian Association of Mauthausen Survivors; and Deacon Andrei Titushkin, staff member of the Secretariat for Far Abroad Countries of the Moscow Patriarchate’s Department for External Church Relations. “These days we must not forget about the sufferings of great many people who died in World War II. Many Russian soldiers and officers, as well as common citizens died in the Nazi concentration camps, including Mauthausen. There were 50 concentration camps in the territory of Austria. Many victims were baptized Christians,” chair of the Austrian Association of Mauthausen Survivors added and thanked the Primate of the Russian Orthodox Church for his contribution to the commemoration of the victims of World War II. “It gives me particular joy to convey to you greetings from Cardinal Christoph Schönborn, Archbishop of Vienna,” Prof. Bandion also said. According to the chair of the Austrian Association of Mauthausen Survivors, it is the sacred duty of contemporaries to preserve the memory of the past, because remembering means feeling responsible for the past, means knowing by name all the victims and culprits and being able to distinguish good from evil and to sympathize with those suffering and dying. The chair of the Austrian Association of Mauthausen Survivors presented His Holiness with the Medal of Merit. The Primate of the Russian Orthodox Church thanked Prof. Bandion for the award and said, in particular, “We have deep respect for your work. You rightly said that the past is something that goes to the future. I think that one of the greatest mistakes of humanity today is that it focuses on the future and often forgets about the past. As you know, the Roman Catholic and the Orthodox Churches are the Churches that preserve the tradition. The tradition for us is not only the preservation of the past, but also the ability to actualize everything belonging to the past but having the intransient importance both for the present and for the future.